Sri Lanka's prime minister has said mangroves' ability to swiftly absorb carbon make the forests vital in the fight against climate change. His comments come on a day marking the first anniversary of a project to protect all of the nation's mangroves. As well as storing carbon, the forests provide habitat for fish and protect communities from tsunamis and cyclones. Also on Tuesday - World Mangrove Day - Sri Lanka's president will open the world's first mangrove museum. The museum will act as a hub for conservation training for adults, and educating children about the value of mangroves. It is estimated that 20,000 pupils will visit the museum in the first year. The Sri Lankan government has also included mangrove forest conservation into its national curriculum. The museum is a central pillar of a five-year programme to protect all of the island nation's mangroves. Prime Minister Ranil Wickremesinghe said: "Mangroves swiftly absorb carbon dioxide and inject oxygen into the atmosphere, maintaining an ecological balance vital for the environment. "It is my belief that the mangrove restoration project will generate much needed awareness among key stakeholders such as the community, leisure sector personnel, tourists, and the general public." He added: "It is my hope that this will be the beginning of a long-term effort to sustain the mangroves for greater conservation benefit." In partnership with island conservation organisation Seacology and local NGO Sudeesa, the Sri Lankan government has identified all of the nation's 15,000 hectares of mangrove forests, and has surveyed almost half of them. Ministers have also introduced legislation to protect the habitats and have assigned forest officers to help guard them. Seacology executive director Duane Silverstein explained that although the project required US $3.4 million of funding, the sum was dwarfed when the ecosystem services provided by Sri Lanka's mangrove forests were taken into account. "In last year, research has been published looking at the economic value of mangrove in Asia," he said. "It has concluded that each hectare has a value of US $194,000 - that would put an economic value of our project at US $2.9 billion." 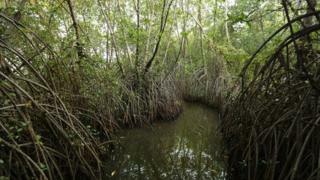 He told BBC News that mangroves were critical in a number of areas, socially as well as environmentally. "Firstly, they provide nurseries for young fish, which are protected among the mangrove roots," he explained. "Secondly, and increasingly important, they provide protection from natural disasters such as tsunamis and cyclones. They disperse the energy in the sea and waves, therefore the villages that have intact mangroves suffer significantly less damage. "Thirdly, and most importantly, mangrove forests sequester far much more carbon than other times of forest. A recent UN report estimated that mangroves store about 1,000 tonnes per hectare in their biomass and underlying soil. There is a minimum of 15,000 hectares of mangrove in Sri Lanka, meaning that the country's mangroves are sequestering 15 million tonnes of carbon." One of the threats facing mangrove forests around the world is the emergence of shrimp farms in order to meet the growing global demand for shrimps/prawns. In order to build saltwater ponds needed to rear the crustaceans, mangroves - which grown in the intertidal area of shorelines - are felled, either legally or illegally. This practice has been identified by the United Nations as one of the main drivers for the loss of the valuable and most at-risk habitat, with more than half of mangroves being lost or felled over the past century. However, the development of shrimp farms in Sri Lanka had resulted in a significant fall in fish catch yields, say local conservationists. This resulted in local fishing communities losing incomes and livelihoods, making them aware of the importance and value of healthy mangrove forests, and keen to protect them. Mr Silverstein said that the conservation model adopted in Sri Lanka could be rolled out to other mangrove-rich nations, however he added that "one size would not fit all". "However, it is very clear that we are demonstrating that a nation can preserve all of its mangroves, and still improve the economic quality of people's lives. "Although the Sri Lanka project has four more years to run, it does take many years of planning. We are looking at working with another nation to do something similar."